Jullien's study functions as Contrast in the CATTt for an electrate metaphysics. Given the rule of heuretics-- that the poetics must be confined to the assigned resources -- it is desirable to have generous resources. The looseness of the heuristics can be frustrating. The first thing to note is that we are not contrasting with Jullien himself, but with the literate metaphysics he describes. Some confusion may arise to begin with since Jullien himself produces our contrast for us. A stricter CATTt might have placed Aristotle's Metaphysics in Contrast, in which case an inversion of that inventory might have resembled an ersatz "China" (just as, in Heuretics, an inversion of Descartes's Discourse on Method resembled a certain "Deleuze"). Derrida recommended in Of Grammatology that a theory and history of writing must include all literacies, not just alphabetic writing but also Chinese, Mayan, Egyptian (et. al.). Electracy in other words learns from and also distinguishes itself from all existing writing. Thus Jullien occupies Contrast in a complex manner. His method is to explain Chinese metaphysics for Western readers by a systematic comparison and contrast between Classical Chinese culture and Western (especially Classical Greek) culture. Our inventory extracts several levels of generative material from this arrangement: 1) Every major point of contrast may first be read as identifying a slot of any metaphysics. Our understanding of "metaphysics" as such derives from Jullien's survey of these two civilizations: we need to generate an entry for these slots by extracting from our Analogy and Theory our own version of what the contrast defines. 2) Chinese metaphysics may be construed as "opposite" to Alphabetic (Greek), and certainly it is "different" in principle, beginning with the difference between Chinese and Indo-European languages. 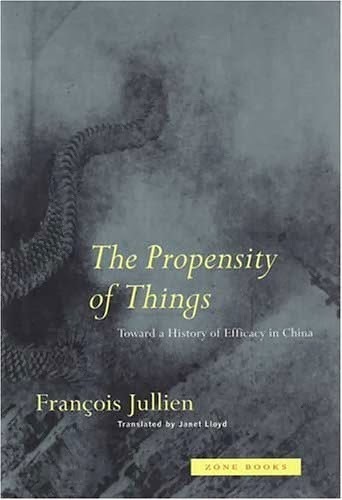 This difference accounts for why at times there are parallels rather than oppositions found in our inventories, so that Jullien produces some analogies as well as contrasts. At the same time, the Chinese case is still a literacy, albeit calligraphic and ideogrammic. While it is true that some major inventors of electracy, such as Sergei Eisenstein and Ezra Pound, used Asian writing and arts as relays for their exemplary innovations, nonetheless an electrate metaphysics will not be Chinese anymore than Greek. Its exact relation to extant civilizations is not oppositional, however, but syncretic, operating as apparatus for a global civilization.